As the first day of autumn is rapidly approaching and most of the blooms in the garden have faded, my trumpet vine is flowering with an exuberance that is positively spring-like. 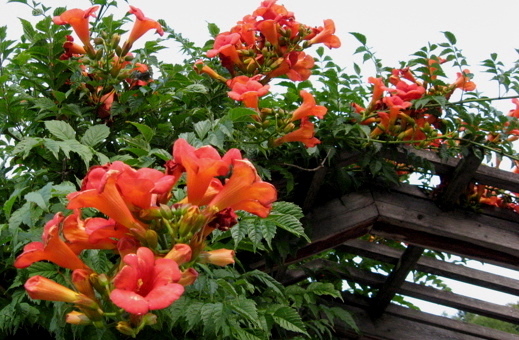 Trumpet vines (Campsis radicans) are vigorous plants that typically scamper up to 40 feet or more in just a few seasons. They cling to arbors and walls with aerial roots. In some parts of the country, trumpet vines can be invasive, but I have not found that to be the case in the Seattle area. Vigorous pruning may be required to keep a vine in bounds, but that's only necessary once, maybe twice, a season.